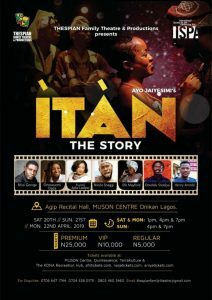 Ayo Jaiyesimi’s ITAN (the Story) staged by THESPIAN Family Theatre & Productions, is an intriguing stageplay performed in English, laced with cultural and contemporary dance and music. An old and lonely recluse and village elder, Pa Latinwo, is shocked to find out that he has a grandson somewhere in the city. He sets off with high hopes to connect with the one person he can call family! He finds his grandson, Dee-Kay but rather than acceptance, this city gangster dares to challenge Pa Latinwo’s beliefs and motives. Both rooted strongly in their generational beliefs, get into a bitter scuffle . Asiko, TIME personified, intervenes and takes them on a journey into the past and the future. They both discover dark secrets that have been shrouded by the veil of time. Does this mediation save the day or tear both worlds further apart? Don’t miss this exciting 90- minute story from THESPIAN Family Theatre & Productions. AGFIP HALL, Drama, MUSON, Stage Play.